Back in 2010, I joined the Marine Megafauna Foundation in Mozambique to study reef manta rays. One of the methods to study these incredible fish is to simply take photographs of them. By one photograph you can often see if it was a male or female, mature or juvenile and even exactly what individual that particular ray is. You see, manta rays have unique spot patterns on the their belly. So by going on dives and taking photos of the underside of any manta ray you encounter you can, over time, start to get an idea of population size, population structure, and possibly even movement and residency patterns. But…. In the vast ocean we are somewhat limited as primarily land-based creatures. 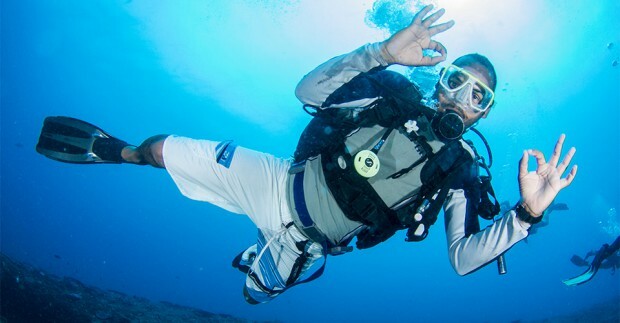 Using regular dive equipment you may be able to spend 1 to 2 hours effectively underwater per day. And of course, you can’t survey multiple dive sites at the same time. After spending 6 months in Mozambique, I returned to Holland and started thinking if there isn’t a more effective way of collecting the same, or more, data. For terrestrial species, photo-identification as it is known, is also often used. And by using so-called camera traps, you can survey multiple areas for extend periods of time. These specialized cameras turn on when something passes in front of it, only taking photos or a short video when it is needed, and conserving precious battery life otherwise. They can be deployed for weeks, months even. To sense anything passing by, a sensor is needed. In conventional camera traps this is most often either a passive or active infrared sensor. So I thought, why not use this underwater?! Put one of these camera traps in a housing, put it on a reef, leave it there for a couple of weeks and pick it back up and see what animals, particularly manta rays in my case, have swum by. If only things were this simple…. These infrared sensors, however, do not work underwater. Infrared light in an aqueous environment simply gets absorbed too quickly by the denser water. So what would kind of sensor can work in the salty sea? There are may number of possibilities, some more practical than others. A friend of mine suggested using the fact that a large animal swimming over will cast a large shadow. Sensors that sense sudden light changes are readily available. So I started working on this. After a lot of google searching and some tinkering, this was the result. Two days before I was to leave again for Mozambique, and with the help of a good friends dad, we even made an underwater housing that would fit all of it in. Did it work in real life scenarios? Not really. 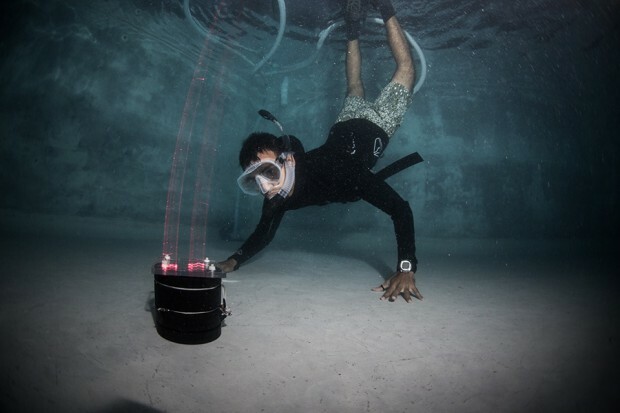 Light diffuses quickly underwater, and unless the water is clear like gin and the sun is out, the shadows created by large objects aren’t harsh enough to trigger the sensor. And it obviously could never work at night, or when it is not pointing upward towards a light source. You could also set up a laser (not infrared) possibly on one side and align it with a light sensor on the other, and if anything breaks the laser it sets off the camera. But good luck putting all those different components in underwater housings and keeping the laser and sensor aligned in the often quite volatile ocean environment. Sonar is a distinct possibility. Sound waves get sent out in pulses, and anything that it bounces off of will get picked up by a little microphone and voila, the camera takes a photo. But sonar also eats away at battery life and in reality is a lot more complicated than it sounds. And most readily available sonar components still emit at a frequency that some animals, such as cetaceans can still hear. To me, it didn’t seem like the solution. So what next? Could you not combine lasers with sonar (evil scientist anyone?)? What if, instead of sound, you emit laserlight pulses? And if these light pulses bounce back off of anything, it gets picked up by a light sensor, in the same housing as where the camera and laser is? No tricky sonar or alignments of lasers needed! Could it possibly work? I started scouring the internet and soon found components that might be suitable. With a lot of mucking around trying different things, I got something that worked. On land at least. With help from a friend, Ando Shah, also working at the Marine Megafauna Foundation, we improved the software and overall size of the device. We did pool tests, and it looked promising. Objects from two meters away were being sensed by our sensor. But would it work on a reef system 25 meters deep? In short, we don’t know yet. Turns out, electronics are not a big fan of a salty air environment. Nor do they like to be accidentally short-circuited, which does tend to happen when tinkering with a bunch of wires, lasers, cameras and batteries. Every time we had a working prototype, something would go array shortly after. 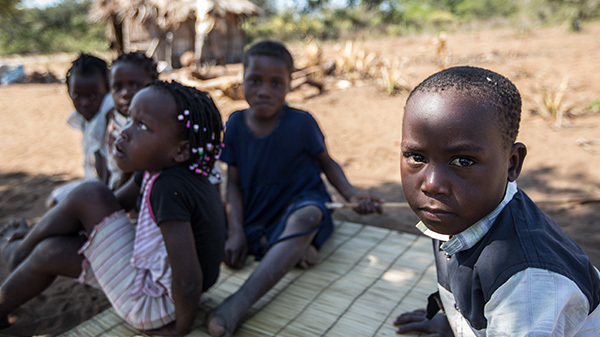 And unfortunately, tiny specialized electronics are not easy to come by in Mozambique…. I once had to wait more than 6 months for a new camera module. So it is still very much a work in progress. But I am confident that it will work one day. 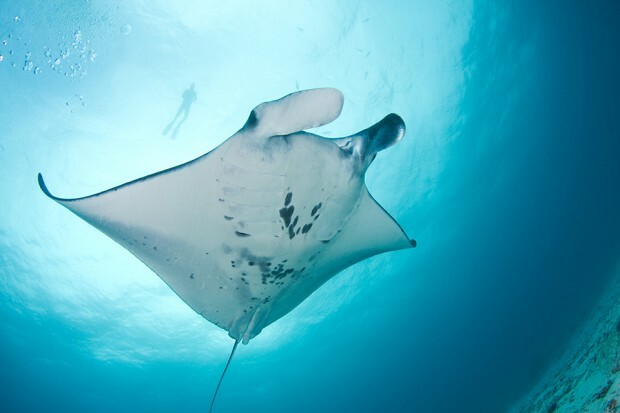 Could it be used only for the benefit of manta rays? No. It could be used for anything really. Document interesting behaviour in the deepest of seas? 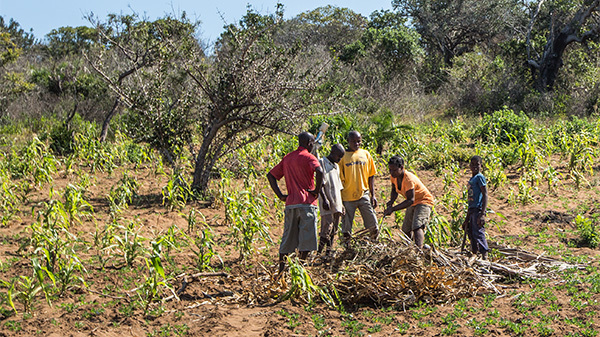 Assess biodiversity in remote areas? Help conserve aquatic species threatened with extinction? Perhaps this little device could do it all. Only the future will tell. Over the past year I have been doing some photography, videography and graphic design gigs, here are a few examples of my work. Together with all-around great guy and amazing photographer/journalist Aaron Gekoski we did the photography for several establishments in the Tofo/Barra area in Inhambane, Mozambique. Here are some of the shots I took at Hotel Tofo Mar…. Next to photography I also did some graphic design work for the Marine Megafauna Foundation starting with this massive 4 x 1 meter banner…. I was also fortunate enough to hang out and work with the guys of the National Geographic’s Pristine Seas Expedition while they were in Mozambique. They used several of my images for a blog post of theirs, and it was a great learning experience seeing filming and doing research underwater (left), as well as getting some amazing aerial shots using remote-controlled hexacopters (right). Next to photographing and designing banners and posters, I was also fortunate enough to head out with the Nemos Pequenos Education program to the Bazaruto Archipelago and do some filming. I also just finished my demo reel for my underwater footage, all filmed in Mozambique. We got excited when we heard there was a satellite tag, which was until recently attached to a great white shark (Carcharodon carcharias). Somehow it had made its way onto Mozambican soil. 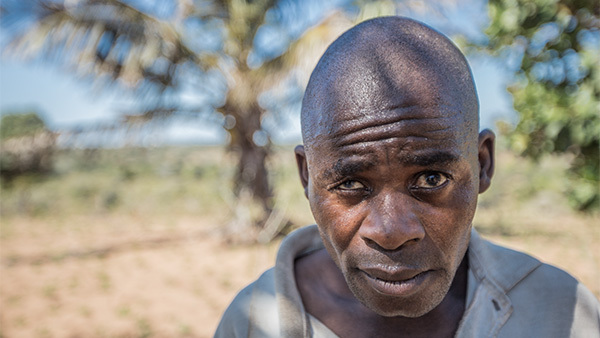 We had been contaced by Alison Kock, research manager at Shark Spotters; she was receiving transmissions from outside a town called Chidenguele, about a three hours drive south from Tofo. Having printed off some flyers and put the last transmission locations into our GPS, Clare and I set off in my rusty 4×4. After several detours, we arrived at the end of a road only 600 meters away from the last transmission and could not drive any further. We parked near a village and started asking around in our best Portuguese. One guy seemed adamant he knew where the tag was and gestured to follow us. Only problem was, this friendly fellow could not talk. All he could do was emit high-pitched squeals and frantically gesture for us to follow him. He was going in the opposite direction of the last transmitted tag locations, but knowing these locations are not always accurate and due to the sheer enthusiasm of our newfound friend, we followed on. He led us around for about 2 hours passing many villages, passing out flyers with my phone number, a picture of the tag and explaining to people what we were looking for. We were starting to lose hope and were about to head back to the car. Disappointed, thirsty and drenched in sweat, we handed out the last of the printed flyers to a group of women carrying water back to their village. A short woman wearing an orange t-shirt suddenly started jumping up and down and cheering. We shortly joined in the celebration as she said she had found the tag on the beach. We were dancing around high-fiving each other. Our murmuring friend grabbed my wrist and raised it in the air as if I had just won the century’s greatest boxing match. Everyone was overjoyed. 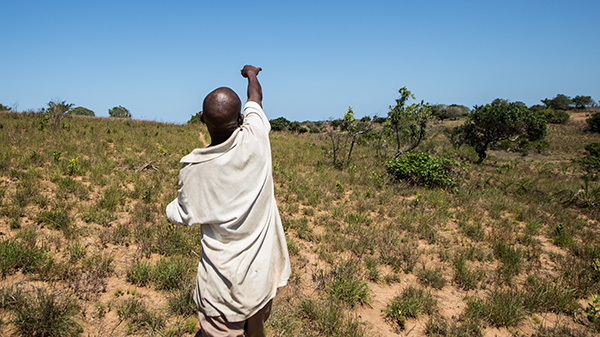 We all went back to her village, a mere 220 meters away from the tag’s last reported location. The chief was called and we asked if we could see the tag. Everyone went off to a strange pile of dead palm leaves about 50 meters away from the houses and started digging away. When I approached the digging site, I got a sudden “espere!” (wait!) from the village chief. I was a bit baffled and hesitantly stood at about 20 meters away waiting to get permission to come closer, take a few photos and help with digging. I soon found out the reason why I was told to wait; this wasn’t an ordinary pile of palm leaves, it was their toilet. And the tag was somewhere in the midst of it. After about 10 minutes they started walking back and washing something in a bucket of water. 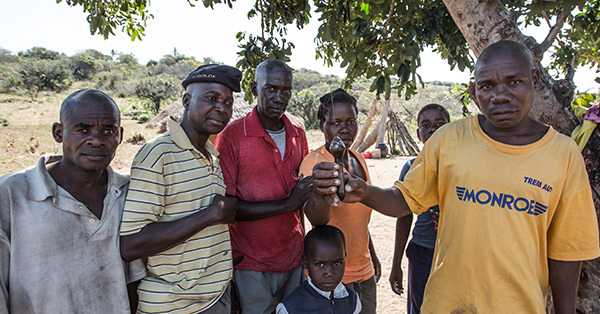 We were eagerly waiting to see if it was the actual tag, a bit anxious of its state as well… after all, it had been in a dugout hole full of human faeces. After a quick rinse they held it up. It was the tag, fully intact at that. We quickly settled on a reward price of 700 Meticais and swiftly found a bag to keep the tag in. The tag will be sent to Alison in South Africa, and will allow for detailed analysis of all the archived data. We hope this tag will help unlock some of the secrets of one of nature’s greatest predator, the great white shark! A little while ago, you may have read my blog post on ‘the challenges of saving ocean giants (part I)’ describing some of the underwater challenges that make marine research, well, challenging. You want to find out where your large, far-roaming, pelagic animal goes. Following it around is just not feasible due to low underwater visibility and the fact that humans are simply not made for being submerged for long periods of time. Luckily there are a number of technologies that might just do the trick for you. Tags allow for the identification or even tracking of individual animals. In the past, researchers wanting to know where a fish species, for example Bluefin Tuna, roamed, would catch them, quickly put a little plastic tag with an ID-number and contact details, get some basic information such as size and weight, and throw the fish back. By working closely with fishermen, hopefully in the next few weeks, months, perhaps even years, someone else would catch the same fish, see the tag, and contact the researchers, providing valuable information such as migration paths and growth rates. One great example of this is an Atlantic bluefin tuna tagged at two years old and just 14 lbs in 1997, which was caught again after sixteen years, now weighing in at a whopping 1,200 lbs! But obviously you won’t be re-catching all the fish you tag, so you have to put out an awful lot of tags to get a decent amount back. Nowadays, there are electronic tags, and they don’t necessarily need to be retrieved to get your data. Two common methods are acoustic telemetry and satellite telemetry. For the acoustic tags to work, you need to put out an array out of acoustic receivers, or ‘listening stations’. These stations listen out for an inaudible acoustic signal that the tags emit every minute or so. By downloading the data stored on the stations, we can see which tagged animals have been around. And you can do this long-term. If you have a way of attaching the tag securely to the animal, or performing minor surgery and fitting the tag inside the animal (such as the abdominal cavity), you can monitor the animal’s presence near listening stations as long as the tag’s battery last. And this can be long, as long as five years. But you can only see if the animal is present in places where you put your stations, and of course the marine environment isn’t going to make it that easy. Environmental noise caused by waves or other organisms (such as snapping shrimp. Yes, you read that right, tiny little snapping shrimp) can produce so much noise that the listening stations cannot hear the acoustic tags properly. You also have to contend with all sorts of marine organisms trying to make the listening stations or tags their home, covering every inch of them. Swell and strong currents might make your stations do a little travelling by themselves, leaving you without the device and, even worse, the data stored on it. Enter satellite telemetry: You aren’t dependent on other devices such as listening stations, and you can track the animal’s day to day movements as well as its depth and the temperature of the water it is in. These sophisticated tags archive data every 30 seconds to several minutes or so for several months, maybe even a year. After this pre-programmed period the tag pops off the animal and transmits daily summaries of all this information to an online database through the ARGOS satellite system. Pretty neat, hey?! But again, there are still challenges to be overcome. GPS does not work in the underwater realm so we have to do with simpler, cruder ways of getting a daily position of the animal. Noontime shifts as you move around the earth longitudinally. The length of the day gets shorter or longer dependent on the time of the year as you move between the equator and the poles. So you can estimate daily longitude and latitude by recording light levels. This all takes quite a bit of computing however, once you get the transmitted information, as it is all dependent on time of the year as well. And light levels aren’t always accurate, as marine mammals tend to dive up and down quite a bit, resulting in inaccurate light level readings. Recently there have been more accurate ways of telling latitude by looking at geomagnetic levels of the earths crust, which can give much more precise latitudinal positions. The data you get through the ARGOS satellite system is only a daily summary of the archived information. If you are lucky however, you can find them back. For my studies on reef manta rays I have been lucky enough to do so and you can read about it here! And of course there is the matter of biofouling, the growth of marine organisms on the tag, and tag retention. 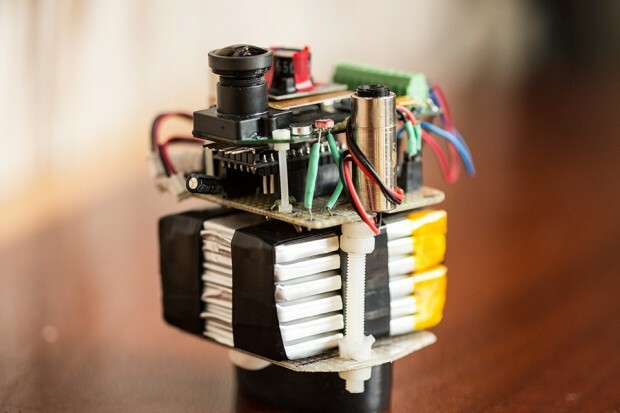 Any biofouling happening on the tag attachment might cause the tag to remain attached to the animal when it is supposed to pop off to transmit all it’s archived information. If this happens, you might never hear from your tag again! Tags also occasionally tend to get eaten. Resembling a little fish swimming alongside your tagged manta ray, whale shark or great white, other predatory fish might gulp it up. And as these devices tend to be several thousands of dollars, this is obviously not something you would like to happen! As technology progresses, we will likely have better ways of tracking the movements of ocean giants. But as for now, we will have to do with the current options. Imagine doing behavioural research on a population of lions on the beautiful plains of the Serengeti. Your aim is to find out where they go. Why? You want to preserve them for future generations. One major implication in protecting an animal, is knowing where they go. If you want to protect and conserve any animal, you will need to know some things about how they go about their everyday life. You need to know ‘what’ the animals are doing and ‘where’. Where are they migrating, feeding, mating and giving birth? And different animals in a population might have different agendas, so it is also important to know what the subgroups, such as males/females/young/adults, are doing similarly, or differently. After all, if you are trying to save a species from extinction, you will not only need to protect one small part of the population. What use is it if you are protecting an area which only males frequent, while the females might be dying off elsewhere? Or if you are only protecting their mating grounds, but not their feeding grounds? Who wouldn’t want to follow these guys around all day long? Each morning, you get up before sunrise, go out into the vast African plains in a rugged 4×4 vehicle, to find the lions. You find tracks to follow or listen to the majestic roars bouldering across the bushveld. After locating the lions, you patiently observe and follow from a safe distance, trying not to disturb their natural behaviour. You work long hours, and get amazing data on where the different prides hunt, rest, mate, where the females go to give birth and where the bachelor males wonder to. If you keep this up for quite a while, you might be seeing yearly patterns. Prides moving north in the winter, south in the summer, following migrating prey. This all sounds amazing, but also quite the feat to find out, isn’t it? Now imagine that same lion population living in an area with extremely dense fog. On the very, very best of day you might be able to spot an animal 30 meters away. On bad days you might happen to stumble upon the lions when you are only 3 meters away. And then just imagine that these are quite odd lions that leave no tracks or emit any sounds to follow or record. And these lions also need to continuously move, there is no resting or sleeping, making it harder for you to find and catch up to them. To top it all of, these lions also live in an environment where you, as a human, can only spend a few hours a day. If you exceed these limits, you end getting sick or possibly even die. This gives a clearer picture of what it’s like to study far-roaming pelagic animals. Manta rays, whale sharks, billfish, great whites; they all live in places and have habits that make it incredibly hard to study them. When the water is like pea soup, these guys might be swimming right by you and you wouldn’t even notice! It is probably quite obvious by now that these animals are quite hard to get your head around. You can’t jump in the water with a SCUBA tank strapped to your back and go trailing a manta or whale shark all day. It is simply impossible due to issues such as decompression sickness, fatigue, cold and obviously the somewhat thicker nature of water compared to air. You cannot follow the animal everywhere. Would you like to swim down to several hundred meters depth, or over a kilometre deep? It would mean certain death. If you do decide to follow your research subject, you are also quite likely influencing the animal’s normal behaviour. How would you feel if someone was trailing you for hours, maybe even days on end, from only 30 meters away? And remember, that 30 meter figure, is on a good day. And you can really only follow one animal at a time, so it will take you a long time to figure out what the entire population is doing. Fortunately, devices have been developed that can help see where animals, both terrestrial and aquatic, go. Perhaps a simple way to study the movements of your pride of ions would be to attach a small GPS device onto an animal, leave it on for as long as the battery allows, then find the animal again, get the GPS back and download the data, which should give you quite precise information on the animals whereabouts. But, you have to find the animal again to get the data. And you would have to design a GPS device that is small and light, battery-efficient, super robust, able to withstand prolonged exposure to water, heat, rubbing up against stuff, moving around and so on. For marine animals, it doesn’t get any simpler. For starters, there are few habitats that are more hazardous to scientific equipment than the marine environment. Corrosive salt water and bone crushing depths come to mind. Add to that that GPS doesn’t even work underwater, and once again, the marine environment is presenting us with quite a few more challenges. So how do we try to overcome those challenges I hear you ask? I will leave that for my next blog. Ecstatic is the right word to describe how we felt after deploying five pop-up satellite archival tags (PSAT’s) on reef manta rays early July. The first ever PSAT’s to be set on reef manta rays on the continent of Africa, these sophisticated devices were programmed to stay on the animals for approximately 100 days, collecting a wealth of information on the reef manta rays’ movements and diving behavior. I have been diligently checking my ARGOS satellite account for any hits every day since the tags were first deployed. These tags are only able to transmit when at the surface, so when the animal is in or in the unlucky event that a tag has shed prematurely. Not expecting any hits until the tags were programmed to pop off on the 10th of October, it was a bit of a disappointment to find a steady stream of hits of one tag after only 19 days! And another tag started transmitting only after 36 days on the animal. My ecstatic state was quickly turned into a somewhat disappointed and panicked demeanor. These tags are highly advanced, and this means a hefty price tag. With each tag having a total cost of around US$3500, you want them to perform well and get the most out of them, especially as the chances of seeing them ever again is pretty slim. The positions we get from these tags when floating at the surface are not that accurate, with errors of at least several 100 meters, making it quite literally looking for a needle in a haystack when it is bobbing around in an immense ocean. However, if washed ashore, the chances of retrieval are increased tenfold. Disappointment soon turned into excitement, when it seemed that we could actually retrieve the two tags. If found back, I could access the raw data on the tag, revealing all the measurements of water depth, water temperature, light levels, magnetic levels and acceleration for every 30 seconds! Far more than what is normally transmitted through the satellite system, which is only a condensed version of the data, this will be highly beneficial to our study on the movement ecology of reef manta rays along the Mozambican coastline. 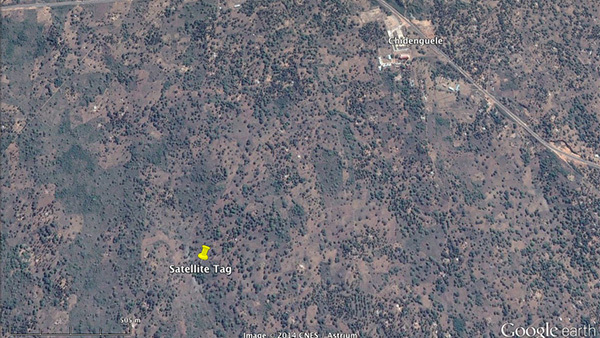 And not only will we be getting this high-resolution data, we will also be able to redeploy these two tags, saving us thousands of dollars. The track of the second tag after it had popped-off. It started about 30km north of Bazaruto Island, and got blown towards Bazaruto Islands by some fierce northerly winds over the course of four days. The tags were found to be transmitting and floating offshore off Bazaruto Island, and within a few days they seemed to have been washed ashore on the island. Lodges on the island were contacted and flyers, with information on the tags and the reward for returning them, were passed out at the local villages. We quickly got word that the tags were found, and after some phone calls, I set out to meet with the lucky beachcombers in Vilankulos. Looking at the data, already some interesting and very different behavior between the two animals can be observed. Tag 128922 showed data of the animal diving down to a maximum of 116 meters deep, but spending his time at an average depth of 17 meters. Tag 128924 however not only dived deeper, up to 184 meters, but also displayed a much deeper average depth of 43 meters. With these deeper depths came also colder temperatures, as low as 15 degrees Celsius. Each animal however also spent time near the surface on a daily basis, showing that they are quite the vertical swimmers. Another incredibly interesting aspect these highly sophisticated tags record is accelerometer data. Every 1.28 seconds it record the accelerations in G per second across the x, y and z axes. This will give us insight into how fast these animals can move, and possibly also when they display different types of swimming behaviors. It may additionally show us when they are feeding, cleaning, resting or simply on the move, information that we could previously not obtain. The task that lies before us now is to analyze all this data. Obtaining the most probable tracks of the animals, performing dive behavior analysis and acceleration data analysis involved a lot statistical modeling. Not an easy task, but Fabrice Jaine, our data analysis guru, and I will be cracking away at it for the next few weeks, fueling our desire to know more about these enigmatic animals. But why have these two tags shed prematurely? Why did they not stay on the animals until the 10th of October? These questions we can also answer, or at least speculate. The first tag to pop-off, was actually initiated by the tag itself. The animal behaved so consistently for about a week that it set off the Constant-Depth-Release. A built-in feature, this enables the tag to release earlier than programmed if for example the animals has died and is lying on the seabed. Judging by the dive profile of the animal this definitely did not happen, but it was diving so consistent that the average depth was similar every day, tricking the tag into popping off. The second tag seemed to have been bitten off by something. This is not something uncommon with tags, as they do resemble small fish swimming with the manta ray. Predators such as game fish or sharks can mistake the tag for a fish, have a go at it, and break off the tether. 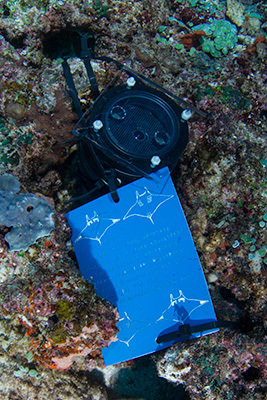 In short, the data we get from these tags is invaluable in the conservation of reef manta rays in southeastern Africa. This is an incredibly lucky start, and let’s hope the other three tags will be retrieved as well! Many thanks to all the people involved in getting the tags back to us; Janneman Conradie of MMF and Big Blue Vilankulos, Luis, Tony, Antonio and Mapanzulo of Pestana Bazaruto Lodge, Anel of Indigo Bay Resort, and Thomas and Arnaldo for finding the tags, Muito Obrigado! * Written by Daniel van Duinkerken. This post was originally posted on www.marinemegafauna.org. Sorry!.. Right click has been disabled for Daniel van Duinkerken.